The Villa dated 1400 is situated within a small medieval town still inhabited by a few souls. 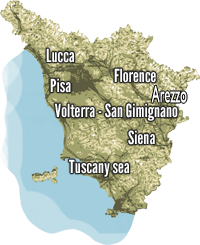 The village is situated on a hilltop in a panoramic position of importance at the border between the countryside of Pisa and Siena. The villa has been beautifully restored to accommodate individual families or groups of about 14/19 people. The ideal accommodation in Tuscany for families or friends who want to share the holiday without giving up their privacy. At ground floor a large salon with sofas and TV, cut into the cave, a dining area and a spacious fully equipped kitchen with direct access to the outside where you can cook all together or at the request, rely on the expert hands of the cook. The access to the apartments is from a staircase in old stone age. The house was divided into 5 spacious apartments independent of each other but with the possibility of being placed in communication with all the lounge and kitchen. At the entrance to the kitchen beyond a small street of the village, is the pergola with tables and chairs for dining outside and a barbecue available for guests. Coming down a small ladder to reach the stone swimming pool, a charming area with all the comforts. The infinity pool with hydromassage area overlooking the wooded hills, for the guests there is also a bathroom with changing room close the swimmingpool. It can accommodate 14 to 19 people. On the ground floor the large living room with sofa and LCD TV, dining room and large kitchen where you can also eat with oven and dishwasher. On the upper floors of the rooms with bathrooms. For exclusive use of guests, swimming pool with jacuzzi, solarium, changing rooms, pergola equipped with barbeque, tables and chairs for oudoor dining .